I had been pretty disappointed with the last couple of batches of Big Ed's which lead to a longer break from the brewing process. However, with the colder weather and some extra time this weekend (ie no soccer!) I fired up the brewing machine. I started the mash at a much too high temperature. This had the interesting effect of making the mash much darker than expected. December 20: Specific Gravity 1.020 - Hmmm a bit too high - seems stuck. Added 2 quarts of Gyle and bottled. Started the week with the first speedwork in ages. It actually felt OK! Nice swim on Tuesday. Wednesday I took the day off of work and finally fixed my Cannondale. I went for an evening ride to celebrate. 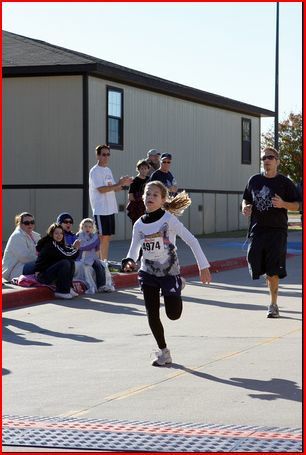 Thursday was the obligatory Thanksgiving race. 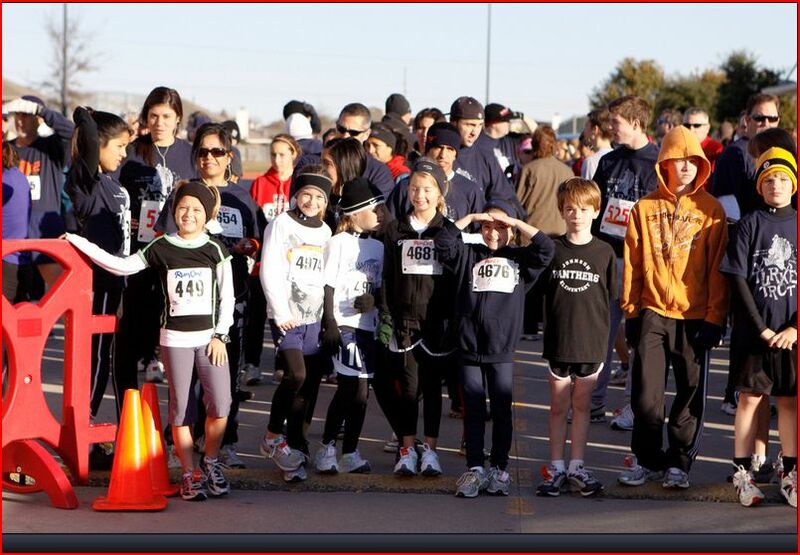 I took Reagan up to the race with a bunch of her buddies from the Gymnastics team. Friday I went back to the pool and felt pretty good with that effort. Saturday I headed out to ride with faster RBM group. Hung with them all the way back to UTD - a good ride. And Sunday Morning I did a nice strong 8 mile run. Overall I am feeling much better than I have in weeks! Wednesday Nov 25: Solo bike up to McKinney Airport in the PM 35 miles bike. 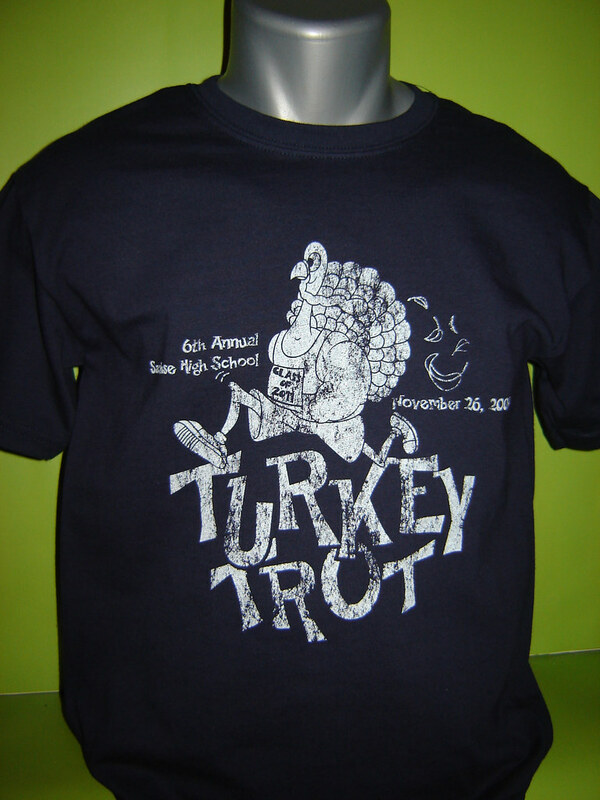 Thursday Nov 26: Sachse Turkey Trot 7.75 miles run. Saturday Nov 28: RBM 905 ride (with the big dogs) 55.7 miles bike. Sunday Nov 29: 61 min run around the neighborhood. Second time in 20 years of NTX running that I came across a bobcat! 8 miles run. Starting with the beginning of October, I have had three separate weeks abroad. And a cold to boot. All of this has taken a toll on the training. On Monday I got back to doing a decent set of intervals, which did not feel too bad. That gave me some hope for running the traditional thanksgiving race. Also on Monday night one of the mom's at the gym (and one of Reagan's former coaches) asked me about doing the Turkey Trot on Thanksgiving morning. The Dallas event is the biggest race of its kind in the country. However, just a few miles from the homestead Sachse High School puts on a smaller event, which is more to my taste. We hatched a plan with four of the gymnasts from the team doing the run as well. It was a spectacular morning for a run. I had a good warmup and felt like I could have a good race. At the start I noted the kid who finished just in front of me last year and also the master who I just beat out last year. I did not see last year's winner at the line. The girls all lined up right in the front row, which is probably not advisable generally, but given the low key nature of this event, I did not try too move them out of the way. From the left starting with 449 - Isa, who is on Logan's soccer team, then the four gymnasts: Reagan, Carson, Sarah and Brooke. I lined up behind Brooke and got around her pretty quickly. The kid who beat me last year was out in front of me with another kid. After the first quarter mile we got rid of all the kids who went out too fast and it was those two in front followed by me and the other masters. The race headed south on Miles Road from the High School, going down the hill to Old Miles and the up a nice hill almost to 190 and then a turn around. This was a new course compared to last year. Going up the hill I managed to catch the kid from last year. He said, to me as I went by, "Hey you're the guy from last year..take it". Heading down the hill I tried to catch the other kid and at this point the Masters went by me and then by the other kid. At the Finish, no one in site. Reagan Kelley with a strong finish! With the Mayor of Sachse Texas for the awards ceremony! 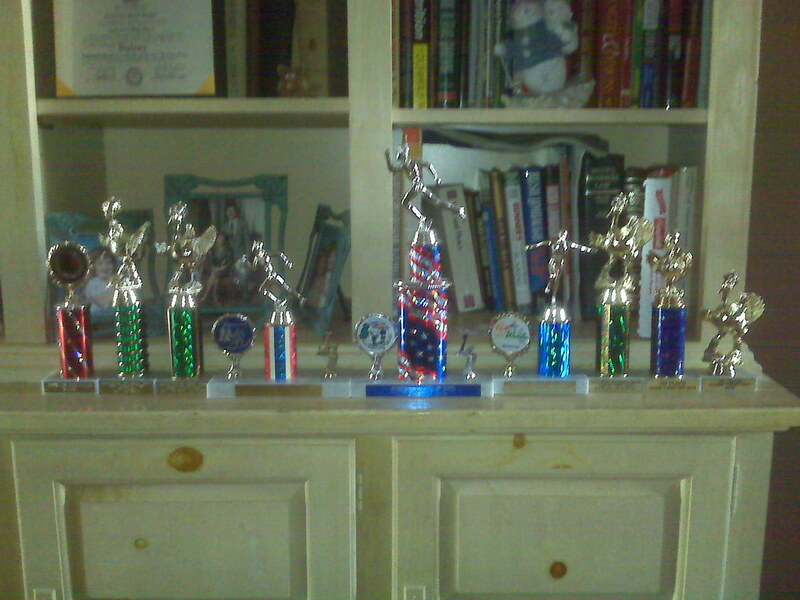 After we got home Reagan demanded that I produce all of the various Turkey Trot Trophies that I had won over the years. This required a trip to the attic to dig through the old trophy box. I managed to produce 9 trophies dating back to 1995. 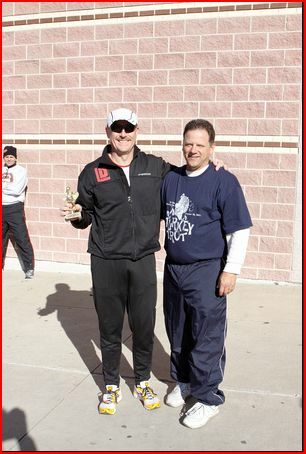 One from the Carrollton Runners Club, Three from the Sugarland Turkey Trot, Three from Run through the Woods, and two in Sachse. Another really stressful week at work. This time in London. I took the Sunday Red-eye from Dallas to London, arriving Monday morning. After checking in the hotel, I headed to the office worked until about 6:30pm, then I headed back to the hotel and managed to still go out for a run along the Thames. Tuesday Morning, I was too tired to run. After a pretty long day at the office, I had a couple of beers at the pub, then back at the hotel, I decided to run out to Kensington Palace. Wednesday I managed to get up early and run in Kensington Gardens. Thursday I did a loop of Hyde Park and Friday, I did a loop of Battersea Park. Friday it was back to Dallas. Saturday Morning I went to the pool, for the first time in a week. Then Sunday I did the RBM ride. The good news is that the Achilles Pain does seem to be reducing. Now to see if I can do some speed work. Monday Nov 16: London PM 34 min, 4 mile run. Tuesday Nov 17: London PM 34 min, 4 mile run. Wednesday Nov 18: London Kensington Gardens AM 40min, 4 mile plus strides 4.75 miles run. Thursday Nov 19: London Hyde Park-Kensignton Gardens Loop. AM 56 min, 6.5 miles. Friday Nov 20: London Battersea Park - AM 40 min, 5 miles run. Sunday Nov 22: RBM Ride (Ave 17.5, ride time 2:5) - 50.7 miles bike. This week was a living hell at work. Which has been generally the case recently. Not happy. Both Tuesday and Friday resulted in my working non stop from 7am until 7pm with no breaks. And no opportunity to get a workout completed. Anyway, I need the rest. On Monday I headed out to do some interval work at Carpenter park. I did some strides and then I decided that I was too worn out to do any decent work. And I needed to rest my Achilles as well - which have been complaining recently. So I did some strides. And I was developing a cold which I needed to nip in the bud before my flight to London on Sunday. Another week abroad is not going to help my fatigue!! Wednesday Nov 11: Austin 30 min run 3.5 miles. Saturday Nov 14: Bike with TZ down to LBJ (Ave 16.1, Ride Time 2:01) - 32.5 miles bike. Sunday Nov 15: RBM Ride (Ave 17.7, CAD 76, ride time 2:51) - 50.7 miles bike. My runs were getting slower and slower this week. Fatigue really seems to be the order of the day. The last two trips (India and UK) are taking their tool. On top of that both my Achilles Tendons have been bothering me, with some PF to boot. Saturday Nov 7: 79 min run - 8.5 miles. Slow! October Started with my second trip to London. I got in some good runs around the various parks in central London. October Ended with a trip to India. Given the travel this was an OK month. Two days Rest. No races planned or executed. 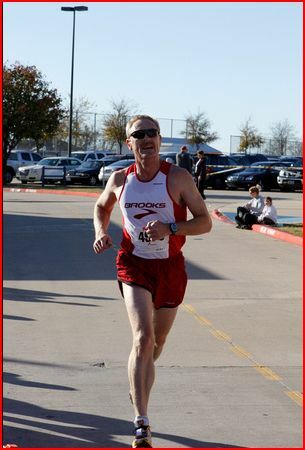 Last Sunday, was to be the start of the fall racing season, with the DRC 5K which is run in conjunction with the DRC half. The half is a huge event, which made the logistics tricky. Just a week before I had been in India, and for the whole week leading up to the race, I was mentally and physically dead. A plan is a plan, so I entered the race against my own better judgement. The race start was pretty normal, I got out at a good pace and was probably around 6th position when we turned up the hill to Mockingbird off of Lawther. I'd guess four or five passed me on the uphill. Once we got to Mockingbird, though, I managed to pick a bunch of them off. 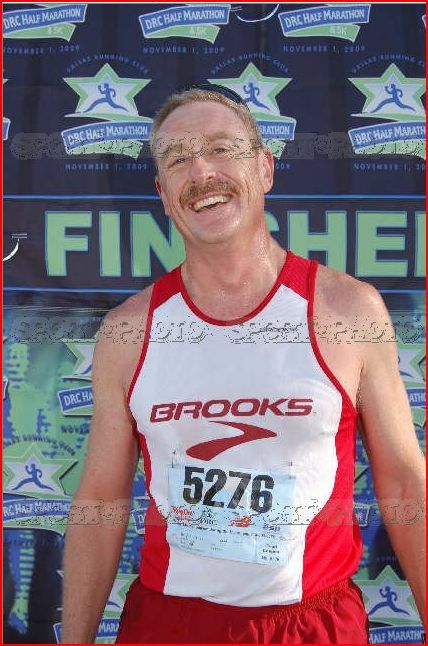 After the first mile and half I had worked my way to fourth. With a mile to go I gave it all I had. But it was not enough, and at about 800 meters to go I got passed. And then coming in for the final sprint, I got passed again - finishing 6th. Good Grief. And it turns out both of those guys were masters runners. Although I can find some consolation in that no one older than me beat me. 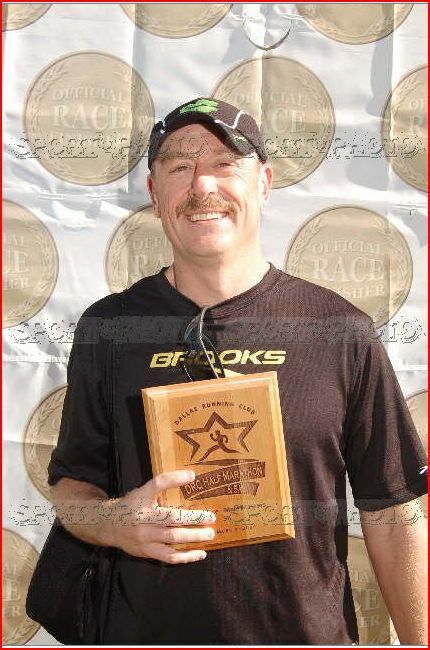 Anyhow, at the race they gave me the Top Masters Award, but according to these results that was mistake.